I just realized the perfection of Chicken Pot Pie. Like a creamy soup, with any veggies you want and a beautiful homemade crust on top. I can tell you for sure: This will not be my last pot pie post of the fall. I used another Kerrygold cheese. There are at least two reasons that I love Kerrygold. First, I will always have a place in my heat for Ireland, and Irish people. The first real trip I ever took was to Ireland. I was just out of college and had spend the past 6 months working two jobs, and finishing up my classes, just to buy a plane ticket to Europe and enough money to see me though a few weeks. I landed in Ireland on a drizzely morning, jet lagged and confused. I had no idea where to go, or how to get there. Before I really knew what was happening, I was being dragged though the streets of Dublin by a charming Irishman who was taking me to a youth hostel at the foot of the Guinness brewery. With a smile and a cheerful welcome, he was on his way, leaving me to realized that this kind stranger had walked at least a mile in the wrong direction just to make sure I found a bed for the evening. OK, so that really has nothing to do with the cheese, but I was able to meet quite a few Irish people and fall in love with them. And Kerrygold is more of a co-op than a corporation and relies on independent Irish dairy farms to source their produces. Second (third?) if you look at the ingredients they are beautifully simple. Milk, cream, salt, all things that I know and can pronounce. 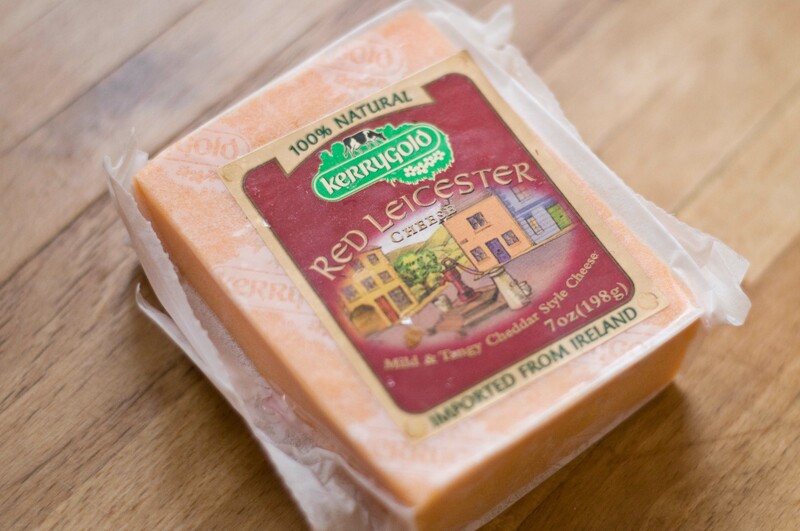 I used Red Leicester, which is a beautiful mild cheddar. Reminds me of the people I met in Ireland, beautiful, honest, full of flavor. 1. Combine 1 cups of flour, salt, and sugar in a food processor, pulse a few times until its combined. Add the butter and the shortening and process until it forms a ball around the blade, about 2 minutes. 2. Add the remaining flour and process until well incorporated, about 1 minute. 3. Move to a bowl and add the water and the vodka, combine with a spatula or wooden spoon. 4. Form the dough into a disk. Wrap the disks in plastic wrap and chill until very firm, about two hours. 5. Preheat oven to 400. 6. In a pan over medium, high heat, add the olive oil. Once the oil is hot, add the leeks and the garlic, sauté until leeks are soft. 7. Add the mushrooms and cook until soft and darkened. 8. Add the chicken and sauté until cooked through, about 5 minutes. 9. In a separate bowl, add 2/3 cup of broth and the flour, stir until combined. Pour mixture into the pan through a small mesh strainer to remove any lumps. 10. Add the remaining broth to the pan and stir to combine. Add the peas, corn, cheese, salt and pepper. Stir until the cheese has melted and is well combined with the broth. 12. 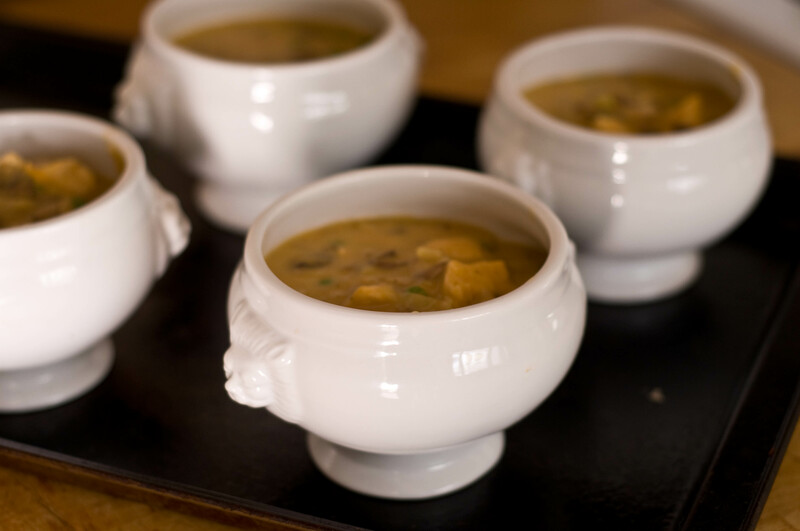 Pour into small, portion sized, oven safe ceramic dishes. Makes about 4. 13. 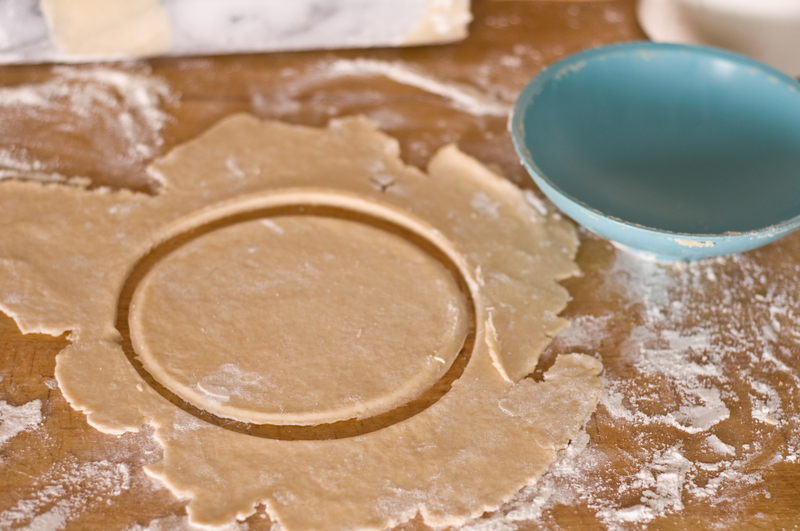 Once the dough has chilled, place disk on a very well floured surface, add flour to the top of the disk as well. Roll out into an even thickness. 14. Cut out circles that will cover the dishes with at least a one inch overhang on each side. 15. 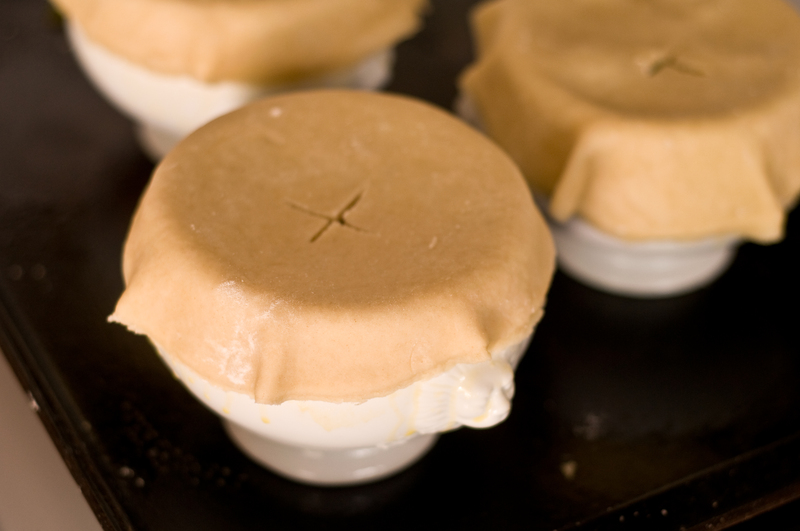 To prevent sticking, spray the rim of the baking dish with cooking spray. 16. Top each dish with the dough circle, cutting a slit to vent at the top. Then brush the dough with melted butter. 17. Bake at 400 for 20-25 minutes or until the crust is golden brown. Allow to cool a bit before serving. 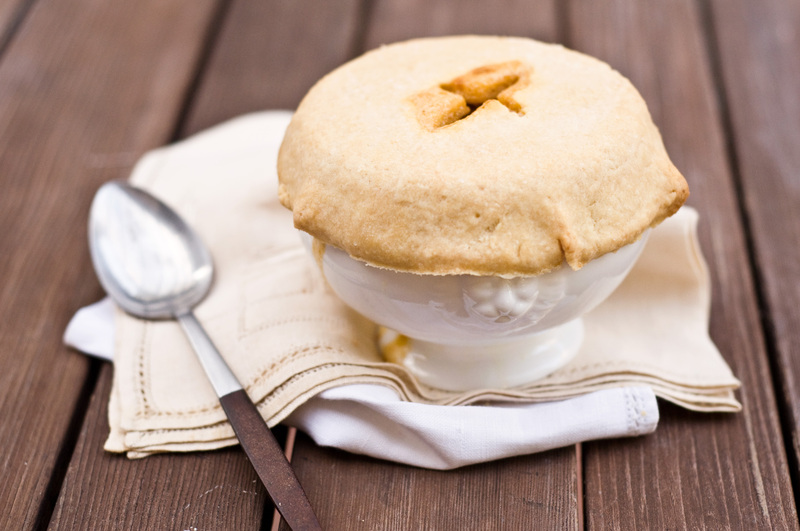 Your pot pie does bring back memories of my childhood. It has been ages since I ate one, but it is time to change that. The title of this post is just too enticing to pass up. I love the ingredients and your pictures are just stunning. Great post. Oh I totally fell in love with chicken pot pie again last year. I love the mushrooms and cheese in here. YUM! Ohh, I love the idea of adding cheddar cheese to a pot pie like this! Yum! Oh my word, the hubby has always sang praises about pot pie but it wasn’t something my mother made regularly (ever). I love this! Will try it out!